This morning I’m writing to you from within a thick mist and it feels a little spooky and cosy at the same time. 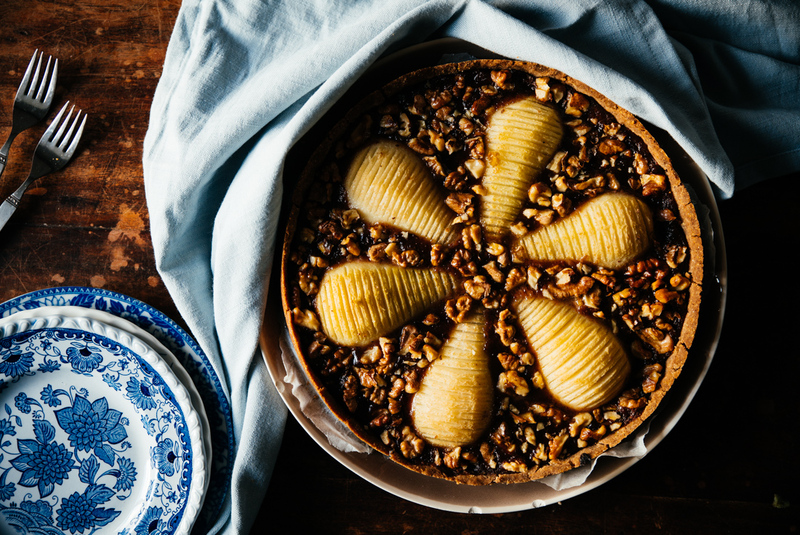 This post is cosy too because I’m sharing a deliciously rich pear and caramel tarte from Jessica Prescott’s, of vegan food blog Wholy Goodness, new book Vegan Goodness. I actually received the book in the mail from the publisher and was so excited as I drove to the gas station where I pick up my packages that I forgot my photo ID. Luckily after the 30 minute drive the clerk was kind enough to (illegally) hand me my new book even though I couldn’t prove I was really me. 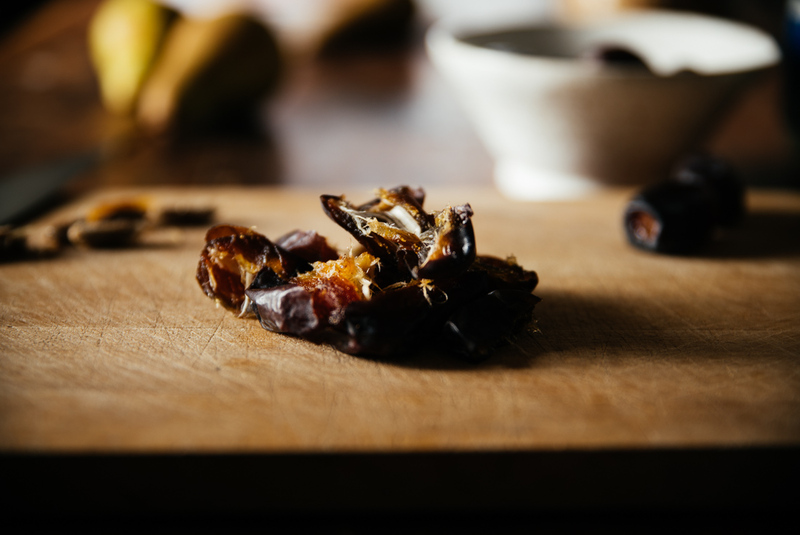 Since that day I’ve been hurrying here and there and it took me some time to actually get the chance to read the book and choose this recipe to share with you but finally here it is. But first a few thoughts on the book itself! 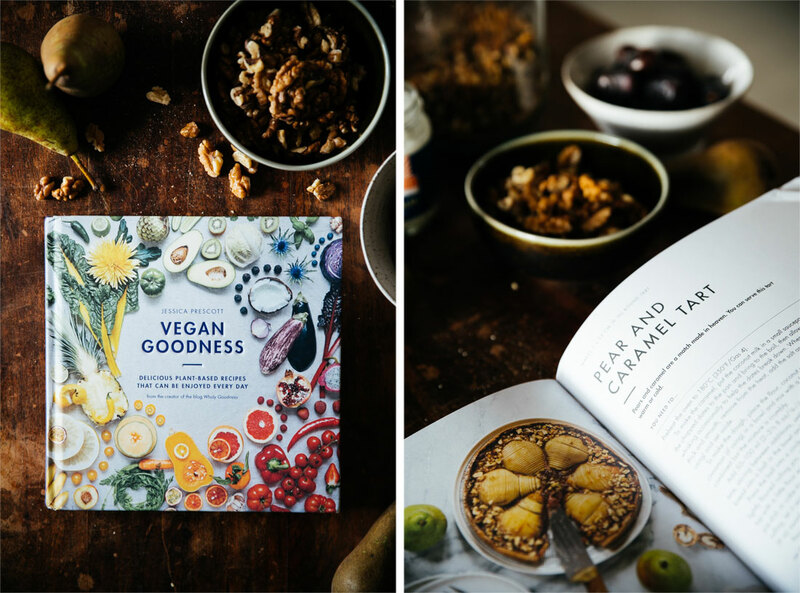 It’s a colourful testament of vegan cooking that I think is suitable both for new vegans, people new to the kitchen and someone like me who likes fun ideas to incorporate in my day to day meals. 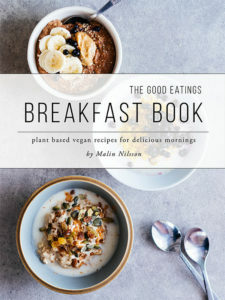 Quite a few recipes are of things I’ve seen before elsewhere but I think they’re great staples and therefore I think this book is especially good for people who’d like an introduction to whole food vegan cooking. 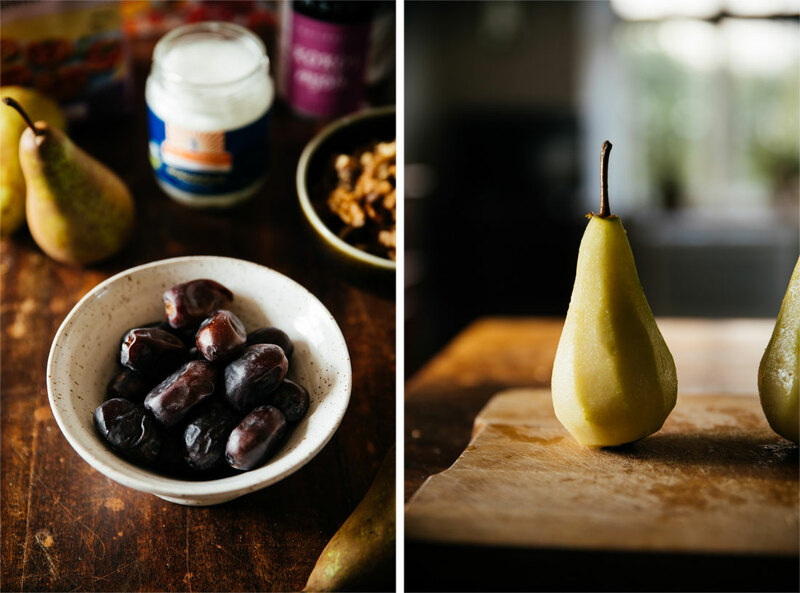 Jessica uses the whole spectrum of whole plant foods to create both quick eats and slow cooking meals as well as a bunch of sweet treats. It’s great to have those quick fix sandwich fillings and salads for days when time is sparse and at the same time get an array of ideas for curries, tartes, pizzas and much more for meals to cook up when time allows. Many of the recipes in the book, like the mushroom stew or spinach and chickpea curry, are great for sharing with friends and family now that the weather’s getting colder. Some would also be fantastic to bring to potlucks and dinner parties like the kale scones or the black bean brownies. 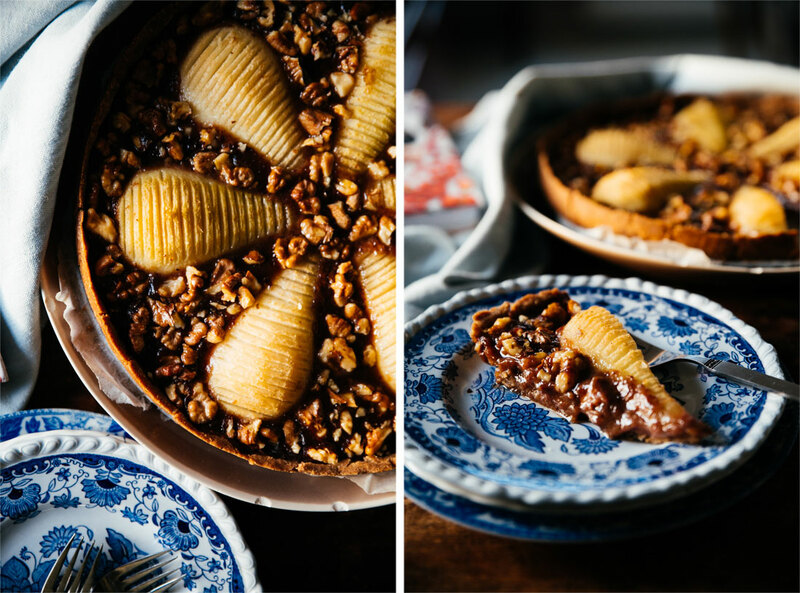 Which brings me to the recipe I’m sharing with you today; the pear and caramel tarte. 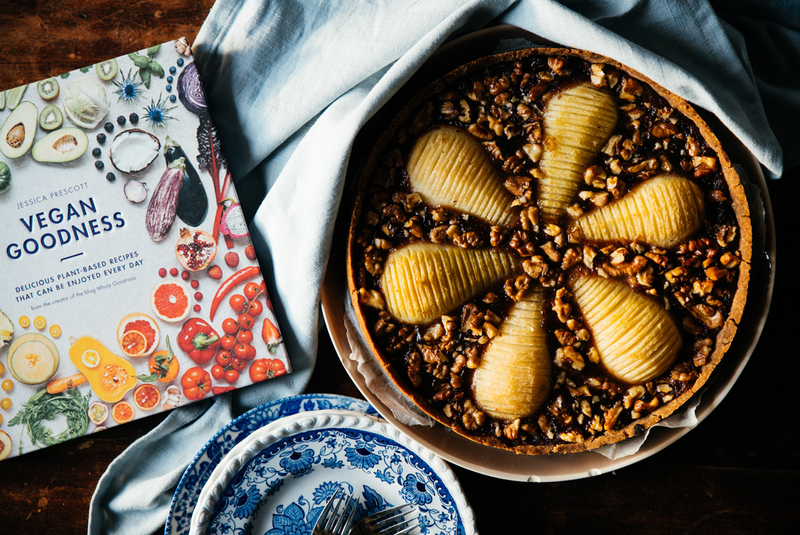 If you’re going to treat your loved ones to anything this week let it be this tarte because it really is delish. Rob loved it and so did my new partner in crime Faye who had two slices on her visit (me too of course). 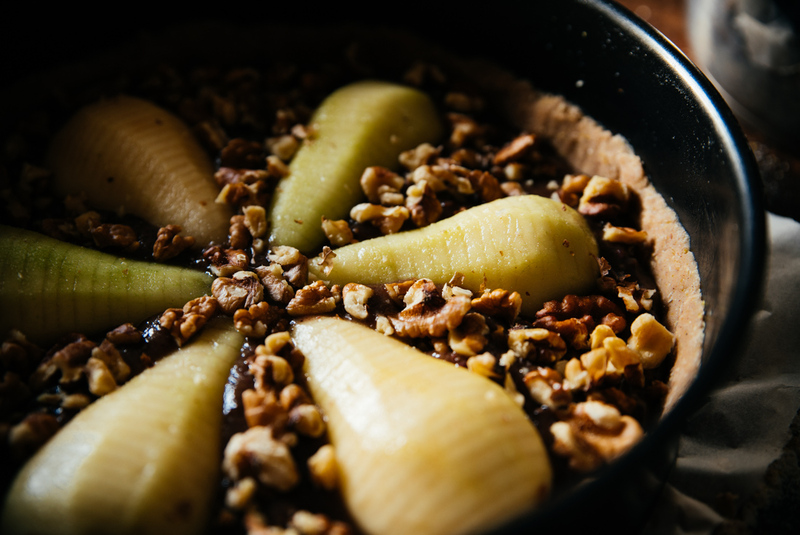 It’s rich with caramel and maple syrup sweetened cinnamon crust which is cut through by the lighter pears making it well balanced and moreish. 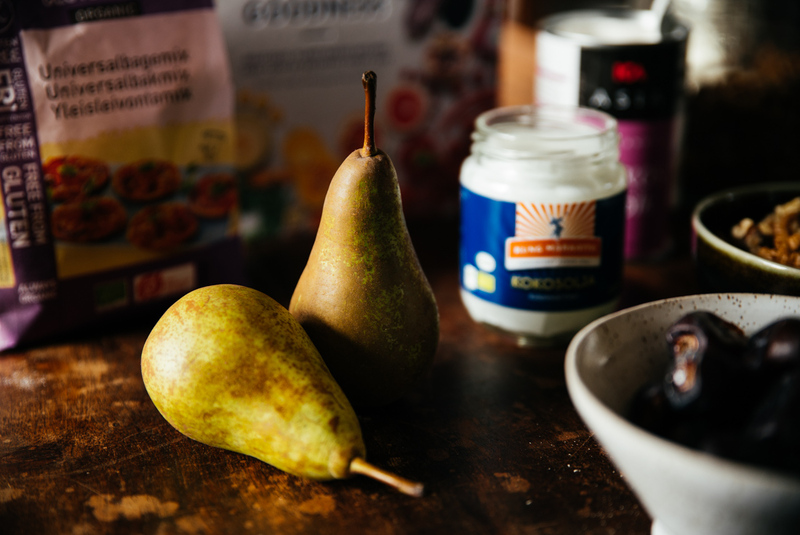 The warm flavours and the fact that the dessert is baked is perfect for these colder autumn months and pears are still in season here in the Northern hemisphere so big hurrah for that. The tarte looks really fancy which can seem a little scary because fancy things are usually hard work, but! 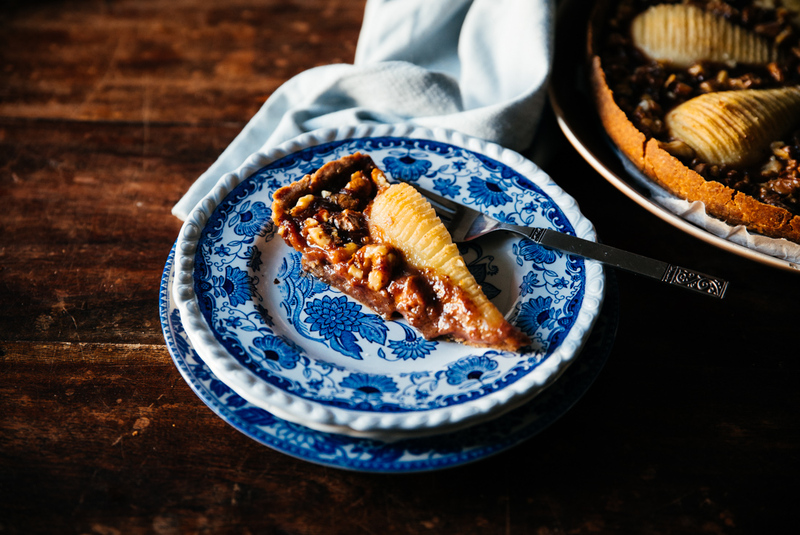 This tarte has a very straight forward process and relatively few ingredients making it the perfect dish to impress without breaking a sweat. Jessica suggests using a spring form instead of a traditional pie dish which makes the cutting process much easier and I also covered the bottom of mine with baking paper making it even easier to transfer onto a serving dish. The fact that I swapped the all purpose flour to gluten free pastry flour made this paper and spring form trick even more useful as I could not roll out the dough but pressed it into the form itself, without it sticking in the end. Add 50-100 ml water, one tablespoon at a time, stirring between additions, until the mixture sticks together. Lightly knead into a ball in the bowl and then place the ball on a floured surface. Press the ball into a circle with your fingertips. Flip and roll flat with a lightly floured rolling pin, then continue to flip and roll again, dusting the top with a little flour each time, until your crust is big enough to fit in your pie dish or cake tin and go up the side a little. If you are having difficulty rolling, let it rest a moment. Gently lift the dough into a pie dish or 23 cm (9 in) round spring form cake tin. Pour your prepared caramel into the crust. Place the scored pears on top and press down so they are nestled into the caramel. 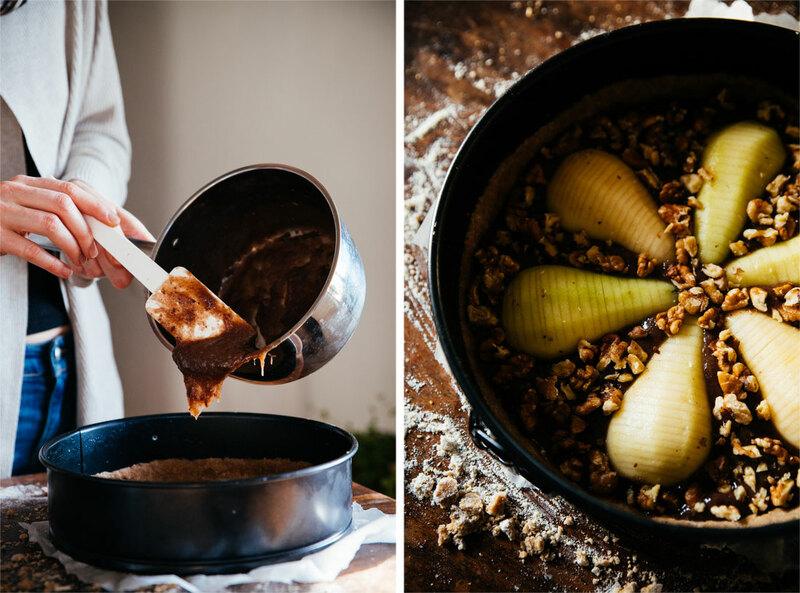 Sprinkle the chopped walnuts around the outer edge of the caramel. Bake for 40 minutes until nice and golden. Allow to cool for at least 10 min before serving with some whipped coconut cream. This looks really good and so perfect for the season! It is isn’t it? Was so happy and inspired when I saw it in the book 🙂 Glad you like the look of it too! Looks so inviting! Love the colors & textures! I’m so glad you think so, thank you! My pears are one day away from being ready to use yet one week away from using them for Christmas dessert! You have any idea if I could pull this recipe off if I freeze them?! Sorry for the late reply, I’m sure your pears have been and gone by now. Possibly frozen pears will release too much liquid and therefore won’t be suited for this recipe I’m afraid.